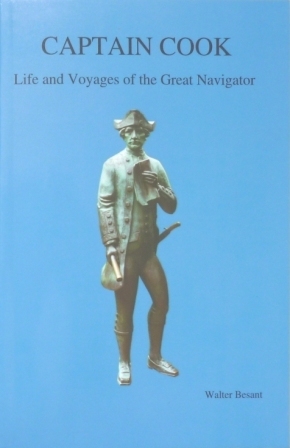 The book gives lots of interesting details of the life and voyages of the great navigator, from birth to death. JAMES COOK, born 1728, Marton, Yorkshire, England, died 1779, Hawaii. The second son of James Cook, a Yorkshire labourer, and Grace his wife. From the lowest ranks, born to be great, when he began to rise, with each step he assumed, as if it belonged to him, the dignity of his new rank. He discovered the Society Islands; New Zealand to be two islands; he followed the unknown coast of New Holland for over three thousand kilometres; he traversed the Antarctic Ocean on three successive voyages, he discovered and explored the coast of New Caledonia; he found the desolate island of Georgia, and Sandwich land; he explored five thousand six hundred kilometres of the North American coast, and he traversed the icy seas of the North Pacific, without counting the small islands which he found scattered about the Pacific. His voyages would have been impossible, but for that invaluable discovery of his whereby scurvy was kept off and the men enabled to remain at sea for many months.